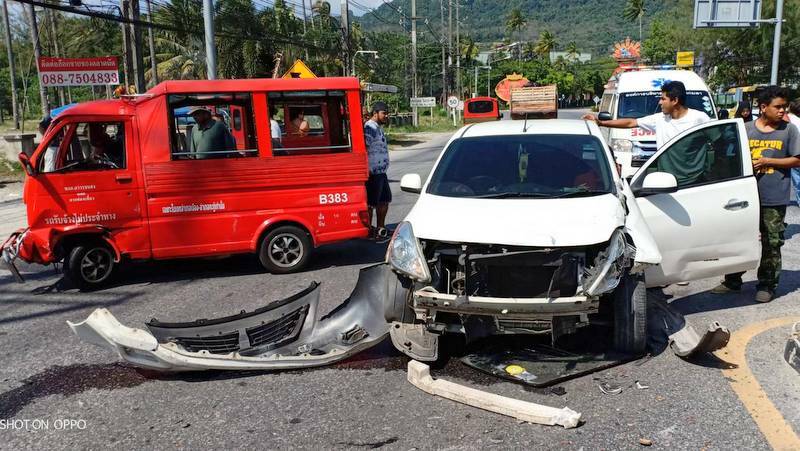 PHUKET: A tuk-tuk driver escaped serious injury after a car crossed into his lane and slammed into the little red vehicle head-on along the coastal road through Kamala yesterday afternoon (Jan 24). The driver of the oncoming vehicle told police that he fell asleep at the wheel. 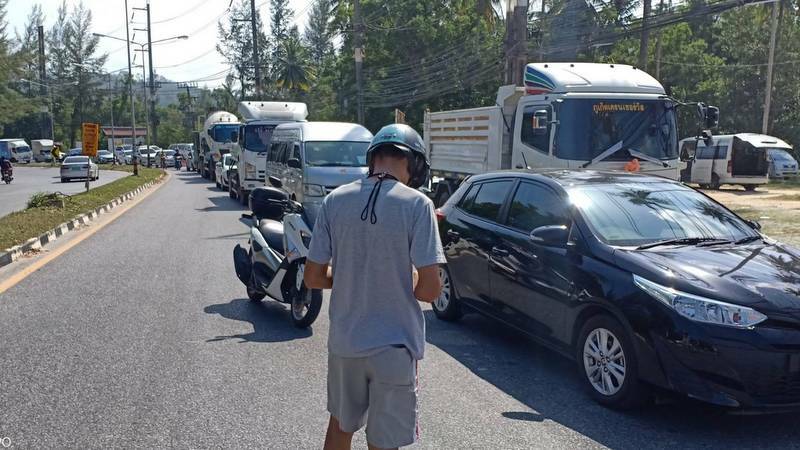 Kamala Police were called to the scene, near the local market about 80 metres from the turnoff to Phuket FantaSea, at 2:30pm. At the scene was a Chonburi-registered white Nissan Almera and the tuk-tuk, both with heavy damage to their front ends. 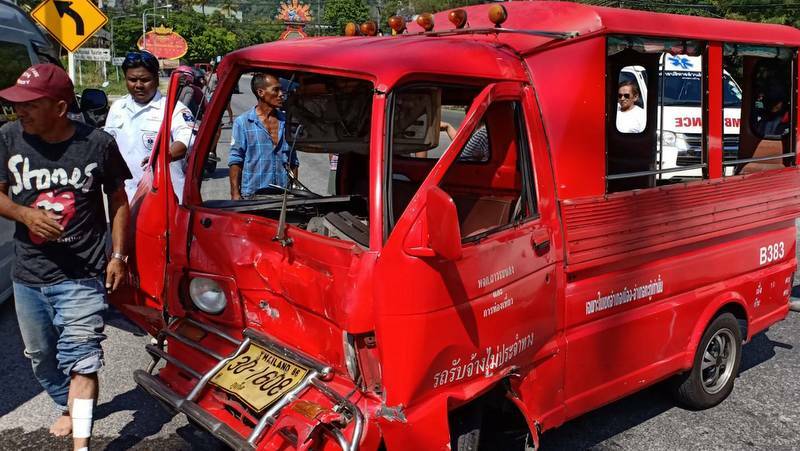 The Nissan driver, Panya Dilokchaturon, 58, and the tuk-tuk driver Sakan Suansan, 48, were still at the scene. Mr Panya had injuries to his head and chest, while Mr Sakan had multiple cuts and lesions to his left leg. Both men were taken to Patong Hospital, where their injuries were confirmed only as minor. Mr Panya told police that he dozed off while behind the wheel, Kamala Police Chief Col Somkid Boonrat explained. At that stage police had not yet charged Mr Panya, Col Somkid confirmed. However, Col Somkid took the opportunity to stress his concern for the lack of road-safety awareness in Phuket. “I want people to be more aware about this,” he said. “The major cause of accidents is disobeying traffic rules on public roads, followed by ghost driving and drunk driving,” he added. Either English is not Col. Somkid's native language, or not the reporter's native language. At least some of us understood what is meant. It was a credit to Col Somkid at having brought the matter to the public's attention. So he believes that ghost riding and drunk driving don't count as  'disobeying traffic rules'?